Use the MARAZZI Artisan Coco 12 in. x 2-3/4 in. 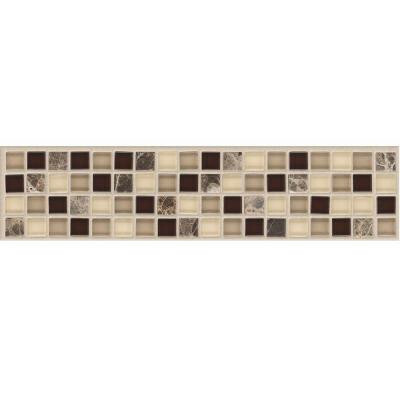 Bellini Mosaic Tile to help incorporate a touch of rustic style into your space. This versatile mosaic tile is designed for heavy-duty residential and commercial floors, including entrances, hotels and sales rooms. Constructed of a combination of marble and glass, this beautiful tile has a Bellini brown/tan color with a moderate variation in tone to help coordinate with your space. This tile is frost resistant for use in a variety of indoor and outdoor projects and features a textured low-gloss finish to suit your needs. You can buy this product in our internet market. We will be glad if you make the right choice. .23 sq. ft. per piece, each piece sold individually. Piece weight equals 1.2 lb.